The Keg Carbonation Lid features a .5 micron stainless airstone attached to the bottom of a standard oval keg lid with 22" of tubing. 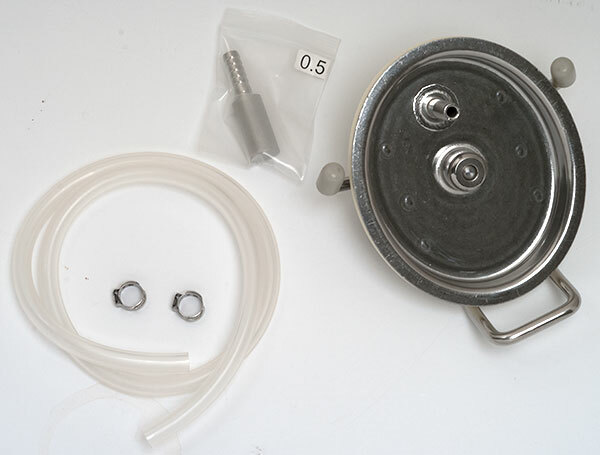 A gas ball lock fitting on the lid means you can inject C02 into your kegged beer from the bottom, and have it permeate up through the beer in fine bubbles for rapid carbonation (3-6 hours if the beer is 40° F. or less and gas pressure is 20 PSI). 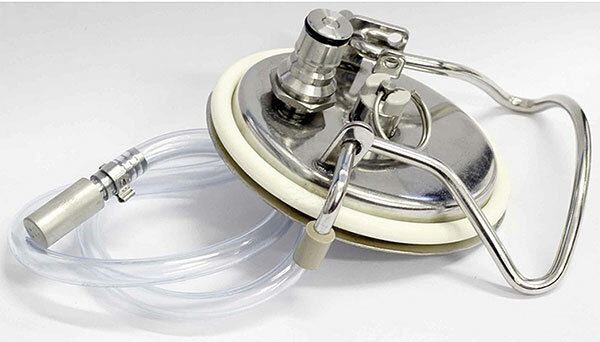 Fits all oval lid kegs and includes a lid sealing O ring and relief valve. To use, install on your keg of beer and chill to 40° F or less. When cold, attach your ball lock gas line to the ball lock post on the lid, and set your dispensing pressure for 25 PSI. Leave for 6 hours and then remove the gas line. Attach your gas line to the IN side of your keg, (removing it from the lid) and release the head pressure in the keg so it is around 6 to 8 PSI. Then turn on your gas to 6-8 PSI to dispense, and your beer will be carbonated. This little lid makes fermenting in a keg a breeze. I removed the gas post and tube and used 1/2” silicon tubing over the post with hose clamp. 1.) loaded the keg, laid keg on its side, and straight from the boiling BK through the 1/2” hose to the kegs (orig gas port)  Flow control was done by using a ‘R53’ on the beer side to control the flow of air out of the keg. 7.) added CO2 through this lid and pinch off the 1/2” hose. I used a beer to beer disconnect hose to transfer to serving keg, then cleaned out the fermenting keg for the next batch. Great product. Works great to carbonate quickly and consistently. Put it on, dial up your pressure and next day it is ready to go. Perfectly carbed. I bought 2 so I man do more than 1 at a time. Definitely pricey but will last forever and worth it. This carbonates beer very quickly. After buying one I bought another for my second keg. Nicely made product with quality parts and workmanship showing attention to detail. I find CO2 psi needs to start off a bit slowly when the beer is cold at 35F or so. I started at 5 psi for a couple of hours, then ramped up to 10 psi for a couple more hours, then finished it off at 20 psi for a total of 6 hours with the carb stone. Removed keg carb lid, replaced standard lid and let rest on normal serving pressures for a day to settle off. This is a super quick method, but be careful not to overcarb as I did twice before learning to control to gas better. This lid works as advertised, and I plan to order another one in the future so that I can carbonate two at once. I do have one recommendation that kept it from a 5 rating. There needs to be a check valve, either at the ball-lock connector or in-line with the stone. If you happen to run out of gas during the carbonation process, the pressure will push beer up into the CO2 lines. It would be a nice addition to have an in-line check valve attached to the line. US Plastics has a couple of options for ~$2 that I plan to add to mine. Can I safely switch this lid with the standard corny lid without losing too much carbonation? When you switch lids, you will lose pressure. This lid seals as well as any keg lid. Can you gradually turn up the PSI say starting at 2 and raising up 2 PSI and ending at 10-12 PSI on a 24 hour period? Yes, you can do this manually with your regulator. What's the best way to sanitize? Boil the stone and Star San everything else? Do you have to disassemble every time? We recommend soaking in Star San or another sanitizer. You can also run some Star San through the line into the stone while it soaks. Boiling the stone also works, although the unit must be disassembled each time you do this. Do you have to remove it after carbing? Or can you just leave it on while serving? Leave it on while serving, no need to remove this lid.